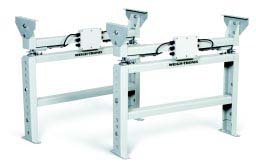 Gain added functionality from the same physical footprint with Weigh-Tronix conveyor scale weigh legs. These bolt-on weigh legs quickly and economically transform conventional conveyor sections into full-featured electronic scales. Save steps and increase productivity with in-line weight measurement and checkweighing. See Pdf download for more information on the conveyor scale weigh legs.